It’s no secret that fixed-rate mortgages have dominated the mortgage market in recent years, mainly because they’re just so darn cheap. They’ve been breaking records left and right thanks to the bleak economic outlook and the Fed’s continued buying of mortgage-backed securities. But they aren’t the only types of home loans benefiting – unfashionable adjustable-rate mortgages are also super cheap, even those that feature a fixed portion for several years. 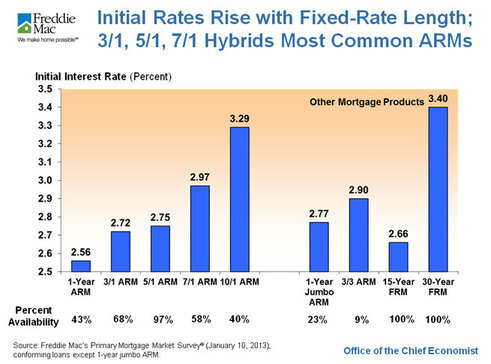 In fact, initial-period rates on ARMs are the lowest in Freddie Mac’s Annual Adjustable-Rate Mortgage (ARM) Survey, which is now in its 29th year. By initial-period rate, Freddie means the teaser rates that mortgage lenders offer to borrowers for taking an ARM as opposed to a safer, more secure fixed mortgage. You see, most ARMs are hybrids, meaning they’re fixed for some period of time before becoming adjustable for the rest of the loan term. They’re all tied to some mortgage index, whether it’s the LIBOR or the MTA, the latter being the Monthly Treasury Average, which covers 69% of ARMs nowadays. The most common adjustable home loan is the 5/1 ARM, which is fixed for the first five years and annually adjustable for the remaining 25 years. In early January, it averaged 2.75%, a 0.65% discount relative to the almighty 30-year fixed, which stood at 3.40%. For a borrower with a $250,000 loan amount, the 5/1 ARM would result in monthly savings of nearly $90. But still, that $90 over five years would result in more than $5,000 in mortgage payment savings, which is surely nothing to scoff at. Assuming the 5/1 ARM presented too much risk, a borrower could go with a 7/1 ARM, which is fixed for an entire seven years. The initial rate on the 7/1 averaged 2.97% in January, which was still nearly a half a percentage point below the 30-year fixed. It would provide even more breathing room for the borrower willing to “take a chance,” especially seeing that most homeowners move, refinance, or prepay around the 7-year mark. Or if seven years isn’t enough, there’s always the 10/1 ARM, which as the name implies, is fixed for an entire decade before going rogue (adjustable). The 10-year stood at 3.29% earlier this month, which was only an 11 basis point discount to the 3.40% average on the 30-year fixed. Probably doesn’t make a whole lot of sense given the fact that you could still be in your home/mortgage after 10 years. In any case, the initial rates on these two types of ARMs decreased by 0.32 and 0.57 percentage points, respectively, compared to last year. If you really want to take a chance in this low mortgage rate environment and snub the 30-year fixed, you’ve got to do some homework to determine how long you’ll need the protection of the fixed-rate period. Assuming five years is ample time to “flip” your property and move on, it could make sense to take a chance (Facebook founder Zuckerberg has an ARM). But if you need more, the 7/1 ARM might be a good candidate as well. The 10/1 is so close to the 30-year that you’re kind of splitting hairs, and you probably don’t want to sit in bed every night counting down the days. For the record, there are also even shorter ARMs, such as the 3/1 and the one-year adjustable, which clearly don’t stay fixed for long. And seeing that their initial discounts aren’t too hot, they also don’t make much sense. At the moment, ARMs are cheap, but there’s a reason I referred to them as “bad news” not too long ago. They aren’t for the faint of heart, and with so much uncertainty ahead, the comfort of a very low fixed loan may just be worth the minimal extra cost. During 2012, ARMs accounted for one-in-ten new purchase mortgages, per FHFA data. Freddie sees them grabbing a 12% market share in 2013.